OUR two-year-old daughter is freaking me out a little. Or rather, her plastic pals are. Meet Ron, Annabel and Vanessa. They sleep at the end of Bonnie’s bed, topping and tailing like we did as kids, in the days before ready-beds and futons. 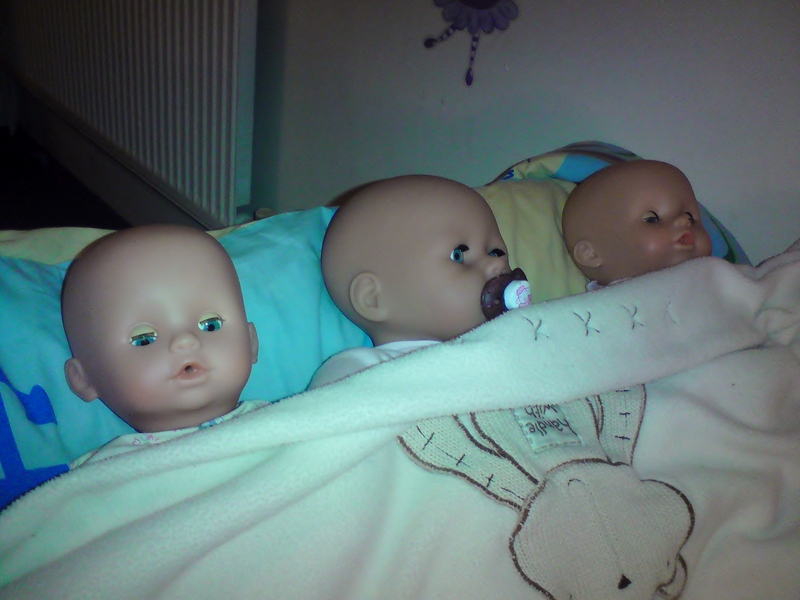 Often when I go into check on the kids on my way up to bed, the terrifying triplets make me jump. By doing nothing more than lying there, staring vacantly, plastic eyes glinting. Baby Ron and Baby Vanessa are twin dolls given when Bonn was just a few months old and not even vaguely interested in anything except eating and sleeping. They were recently pulled out of one of far-too-many toy-boxes and adopted by Bonnie. “My babies. My sisters,” she burbles away to herself, dragging them around, upside down, by their ankles. They aren’t exactly cuddly dolls, being of the cheap plastic variety with stiff movement at the hips and shoulders. Baby Annabel is a little posher, arriving a couple of Christmases ago, but she weighs too much for a two-year-old to carry easily. She makes weird noises but thankfully can be ‘put down for a nap’ by flicking a switch hidden in her battery pack. Baby Annabel’s name is a given – she arrived with it – but what about Vanessa and Ron? Not exactly ‘child-like’ names. Seven-year-old Billy thinks he came up with Ron’s name. Why Ron? “Cos it’s a boy’s name,” he explained, as if I were a little dim. And Vanessa? We don’t know any Vanessas. It’s not even an easy name for a two-year-old to say. I’m baffled. Still, her favoured toy pals have more easily explained names, and are soft enough to be allowed to sleep at her end of the bed. There’s Pom the ragdoll (her dress has apples on it, French for apple is pomme, (how middle class)), Arthur the Rabbit (‘R-for-Rabbit, geddit?) and One-Eye, the bear with, er, one eye. Sometimes it’s best to keep things simple. . . There's a teen in the house: Y'get me? © Hilary C Scott, 2010/2011. Unauthorised use and/or duplication of this material without express and written permission from this blog’s author is strictly prohibited. Excerpts and links may be used, provided that full and clear credit is given to Hilary Scott and Hilary Scott Writes with appropriate and specific direction to the original content.